Do you have several different writing projects on the go? Maybe you have a blog, plus you’re working on a novel. You also have a few short stories that you want to revisit and find markets for, and you’re thinking about trying something new, like poetry or screenwriting or memoir. Oh, and there’s that book you abandoned a couple of years ago that you’d like to finally finish. Regular blog posts for half-a-dozen different clients (some under my own name, some ghostwritten). 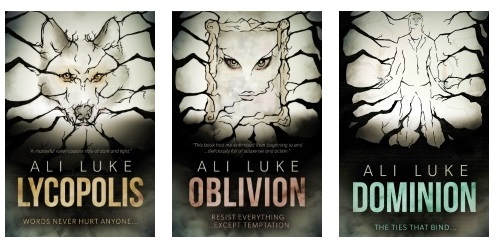 A trilogy of novels, plus a standalone novella, that I really need to market now they’re out there in the world. A fourth novel that’s half-way through a scrappy first draft. A couple of screenplay ideas that exist only in my head and need to be worked out on paper. A short non-fiction book that I’ve been working on, sporadically, since 2016. My own blog (Aliventures), where I write weekly posts and newsletter pieces. My online courses: all the upcoming ones need writing / rewriting. As you might guess from that list, I’m not here to tell you that you should pick one single project (or even a single area of writing) to focus on. I completely understand why you might want to have multiple projects on the go, whether that’s for financial reasons (perhaps you need the money from your freelancing to support you in writing fiction), or simply because you get bored if you only work on one thing. How can you manage multiple different projects, though – without ending up going pretty much nowhere with all of them? I often think I can cram dozens of tasks into my day … but when I attach a time estimate to each, I quickly realise that I’m not actually going to manage to write three blog posts and plan two more in a single morning. How much time do you have available for your writing? Figure it out on paper … and allow for a realistic rather than best case scenario. If you work full time and can only write in the evenings, you might be able to write from 7pm – 9pm on three or four nights a week. Depending on your other commitments (and energy levels), even that might well be too ambitious. There’s clearly a big difference in what you can accomplish in, say, four hours total per week versus twenty hours total per week … so make sure you know how much writing time you actually have. Right now, my main focus is on my freelancing work and my online courses. These occupy my working hours during the daytime (chiefly when my kids are in preschool/school, but also a 5.30am – 6.30am slot each weekday morning). I’ve also got a couple of other projects I’m working on: a novel that, frankly, isn’t getting much attention at all, and a screenplay that I’m just starting to jot down ideas for. At the moment, these need to fit into my evenings – which, by the time the kids are in bed and my husband and I have had dinner, realistically means I might get to write for an hour on three or four evenings a week. Keeping a specific weekday or days clear to work on fiction (I used to use Fridays for this). Writing fiction during a particular time slot each weekday (I’ve done “first thing in the morning”, during my lunch hour back when I had a day job, and from 5.15pm – 5.45pm for several years while the kids were small). Having a particular day for freelance work – I used to do the bulk of my freelancing on Mondays, back when it was a smaller percentage of my overall writing. How exactly you organise your week will, of course, depend on all your other commitments: if you work full-time and have kids, your writing week will be much more constrained than the writing of someone who’s retired and lives alone. Whatever your week looks like, though, look for ways to carve out regular writing sessions for your different key projects … that’s the only way they’re going to get done! I’d like to write more short stories – but realistically, that’s just not going to fit in right now. While I enjoy writing them (and get a particular thrill from winning a prize or even getting shortlisted in competitions), my main focus as a fiction-writing is on marketing my novels and writing more of them. I want to explore screenwriting too, and that’s taking up all the remainder of my fiction-writing time. This doesn’t mean that I’ll never return to short stories, of course: just that I’ve ruled out working on any at least until September (when my youngest starts school full time). Are there any projects that, much as you enjoy them, simply aren’t a priority for you right now? Make the deliberate decision to set them aside, at least for the next two or three months; that way, you’re not constantly feeling guilty about not being able to give them any attention. Do you have a particular project that’s near to completion? 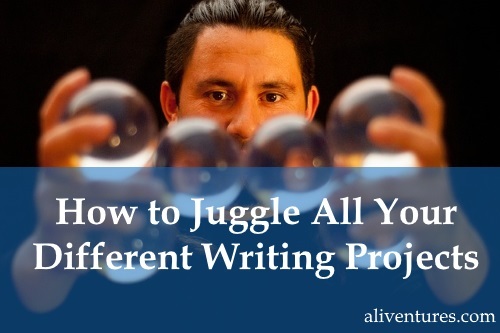 If so, you may find it’s much easier to juggle everything else if you focus your time on finishing that one project so you can get it checked off your list. You might want to set yourself a deadline (the end of January, maybe if it doesn’t need much work, or perhaps Easter). Even if other projects have to wait until then, they won’t be missing out for too long. One nearly-done project I really want to get finished is my non-fiction book that’s been dragging on for way too long. I can’t spare much of my working time for the next few weeks, but I’ve decided that I’ll allocate an hour to it every Friday morning for now and get it finished by the end of February at the latest. What different writing projects are you working on … and how do you balance them? Is there a particular project that you want to focus on, or one you want to put to one side for now? I’d love to hear your experiences and your tips: just leave a comment below. Interesting comments about finishing a project. My alphabet book about the State of Idaho, USA is almost there. It is in the hands of the gentleman who is doing the formatting. When that is finished it will go to he proof reader/edit person. So I am a wee bit excited. I, too, have a blog that takes each letter with three options one week, and the answers the next week. That pushes me to get it posted each Thursday. It’s an interesting journey. Whooa and I thought I was busy! Still working on starting my freelancing business which is currently ethereal –in the clouds of thought. Three web sites which I will consider their worth. One for endangered wildlife and my business site. The other originally for wildlife being a carry over of a previous one, but once I found WordPress, I may use this one for use as a running advertisement for S&G. Exerpts and hints on the continuing story as it evolves into a series. A plethora of novels, yet to be finished, sci/fi, adventure, horror, romance and my series formed from ‘The Adventures of Snowpuss and Gidley’, which is awaiting the last few sketches of characters for placement, before I put it to Amazon. Blogging time for research of where I could make inroads in my craft, which is comprised from reading until my eye-balls explode. I seek my niche which I have not found –yet. So, good luck with your time management Ali, the cleaning, cooking, shopping and looking after my two kids (Puddles and Tiger), apart from washing, looking after Judy(my partner), exercise these old bones and taking Puddles for a walk every day for diet and exercise I sometimes wish for the one thing we cannot buy ‘Time’. Wow, Jeff, that sounds pretty busy too! Yes, I would love an extra hour or two in the day, or an eighth day every week, to get everything done. I liked your idea that calculating available time and allocate that on different projects. It’s really a practical way. Currently, I’ve two blogs and I publish one post a week on each blog. I’m also writing a book. And you know, there are many other tasks to do as a blogger. Setting a time block for each task helps me a lot to focus effectively on different tasks. Liton Biswas’s last blog post ..How to Become an Affiliate Marketer as a Newbie blogger? That sounds like a very sensible publishing schedule for the blogs. Yes, there’s so much bloggers need to take care of — I think all the extra bits and admin often takes up more time than the actual writing! Thanks Ali. Really sensible advice here. 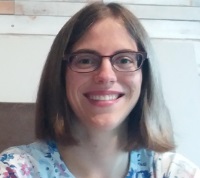 I need to figure out how I am going to write the 1st draft of my next novel, continue with blogs on my website and find/write guest posting opportunities. Time for some planning I think! I can relate to this blog post because I have to juggle freelance work and personal blogs all the time. You may not remember that I emailed you last year about this fiction idea that I want to put out and you said just go for it. I couldn’t finish up the first chapter yet; it’s been months since we communicated via email. However, I came up with a plan of scheduling my blog posts that provided a little bit of room for other stuff now. I have plenty of things to write and not enough dedication to get to them all! At the moment, I’m focussing on reviving my blog as well as writing one book draft, starting a second draft of another, finishing a collaborative writing project and working on yet another. And dealing with the ideas for shorter stories that come along occasionally on top of all that. All in all, I am definitely in need of advice like yours. Thanks for sharing these tips. Making time for everything I want to do has been a struggle for me. I have a full-time job with a commute time of about an hour each way. I have very low creative energy after work, so evenings are a no-go. I originally planned on trying to write for an hour in the morning before work, but realized that was too ambitious and affected my sleep quality. I’m starting small and going for 15-30 minutes and save the big chunks for the weekend where I have much more free time. I think the key for me is that I just need to try different time blocks and see what works out best for my time and energy levels.